This is the first (and maybe ONLY!) Flaky and delicious pie crust recipe that requires NO CHILLING, contains NO TRANS FATS, has only 3 HEALTHY ingredients, and is OVEN-READY in mere MINUTES! In keeping with the trend towards healthier foods, most of Penny’s pie recipes are also HONEY-SWEETENED to eliminate the use of refined white sugar! 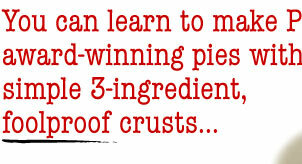 Penny Keaton of LaCanada, California learned the secrets of making foolproof flaky crusts and delicious pies passed on to her by her mother and three aunts that even professional pastry chefs don't know or use. 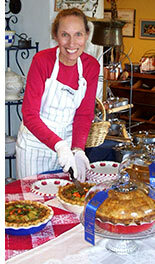 In fact a local blue-ribbon chef, after attending one of Penny's classes has become a devoted promoter of Penny's recipes and techniques and even helps out at Penny's classes and demonstrations. Never baked a pie before? No problem! 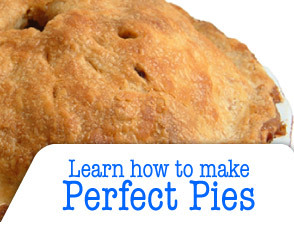 Penny lists all the ingredients, tools and techniques to make even your first pie crust and filling perfect. 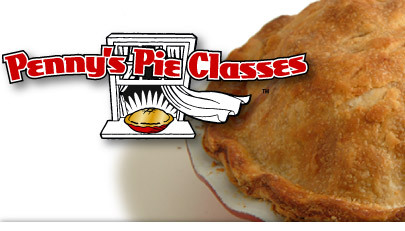 Click here to sign up for one of Penny's Pie Classes. Now available is Penny’s Pie Class on DVD! 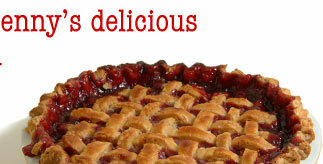 A 27th Annual Telly Award winner, “Simple, Fun & Foolproof Pie-Making for Everyone” is the easy way to learn Penny’s techniques for making Blue Ribbon winning Pies! See ‘STORE’ page to order & for more info. Bringing Friends and Families Together: One of the primary aims of Penny's Pie Classes is to help bring together families, friends, loved ones, associates and anyone else so that they can share good food, good company and good communication. Click to read what our customers say about the classes and video. 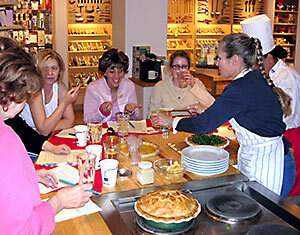 Penny's Pie Classes, founded by Penny Keaton of La Canada, California, is an educational organization with the goal of reviving the art of home baking through live public and private classes, demonstrations, training of teachers and educators, and through various educational tools and media. It is the purpose of Penny's Pie Classes to impart competence and confidence to its students and to provide the public with basic home-style cooking and baking skills that can be shared and enjoyed with family, friends and associates.